Type: BOOKS. Detail: Purdy, CJS. Product Code: 0938650807. Category: UNDER $10. Publisher: Thinkers Press. Bobby Fischer raved about the chess writings of CJS Purdy. In Purdy's lifelong writings, he came to concrete conclusions about chess, and how it should be learned, as a result of this deep reflection. 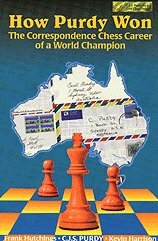 How Purdy Won was Cecil Purdy's account of his road to victoryin winning the 1st World Correspondence Chess Championships.An unique book since Cecil was the World Champion butwas also an excellent writer explaining his ideas while playingin the grueling competition.An excellent book and modern day classic.Highly recommended! In Search of Zugzwang. Brieger & . $9.95.